It appears most fans are reading about us at work… Y’all have lots of post to catch up on from the long weekend. Don’t let the boss catch you. 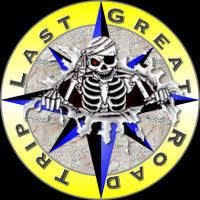 There are approximately seven billion souls in the world, 33,009,102 people living in Canada and two cool Internet domains “lastgreatroadtrip.com” (thats us) and “thelastgreatroadtrip.com” (an annual publication dedicated to traveling Alaska and British Columbia). Guess who we ran into today? And check out Greg’s Toyota… Right hand drive. 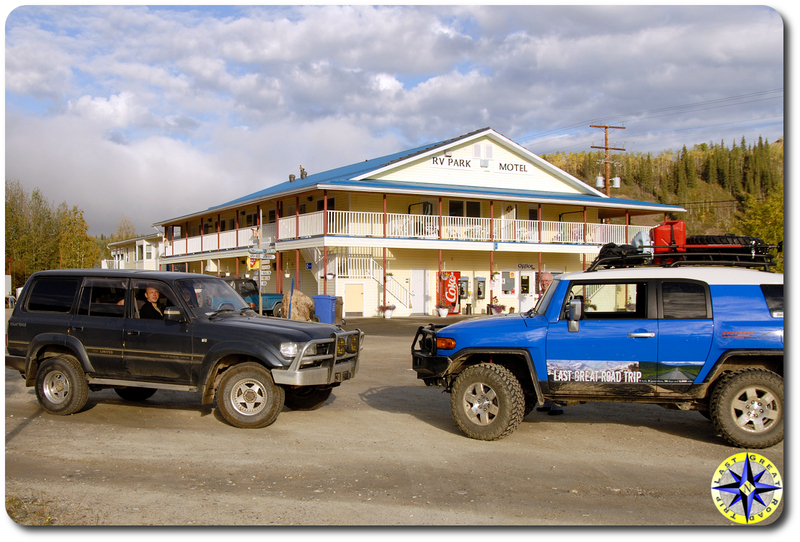 Dawson City is still thriving on its mining and gold rush heritage. Many of the businesses have a history dating back to 1900s and ties to the historic figures of the town. 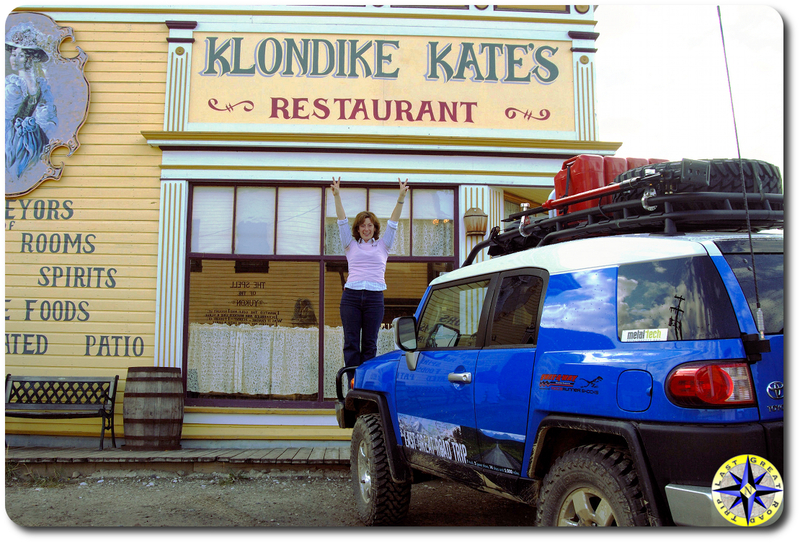 For example Klondike Kate’s is a tribute to Kate Rockwell known as: “The Queen of the Klondike”, “flower of the North” and the “Darling of Dawson” by the miners of the time. 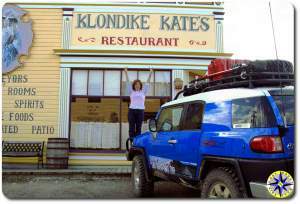 Today Josee Savard is the proprietress of Klondike Kate’s and as she jumped up on the bull bar I swear I heard, Silly boy, 4×4 rigs are for girls! 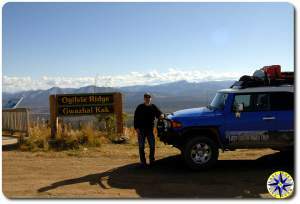 Turns out Josee loves the FJ Cruiser and is planning to get one soon. She is hoping Toyota will see that she is the self-appointed number 1 Toyota fan and reward her with a discount on her FJC. As you might have guessed Kondike Kate’s has t-shirts, and Josee was eager to make a trade. Hopefully we’ll get a picture of Joesee and her FJC as soon as she picks it up. 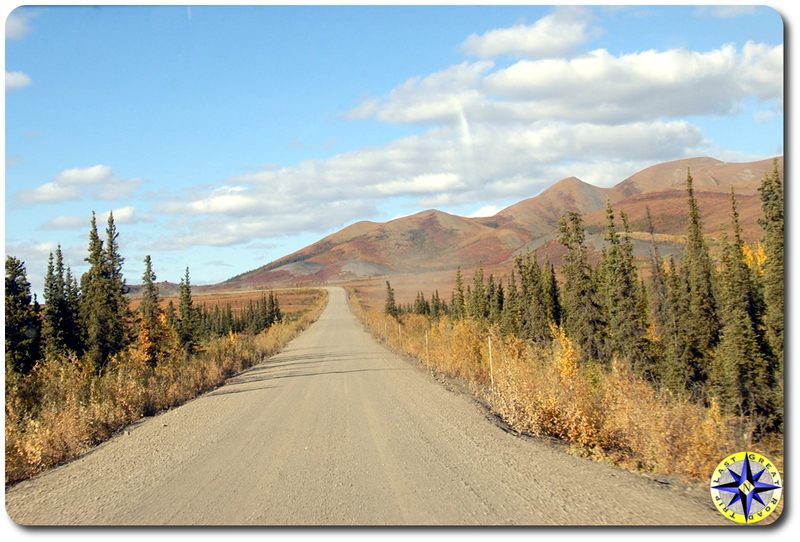 When this adventure was first conceived, traveling the Haul Road was the major goal. 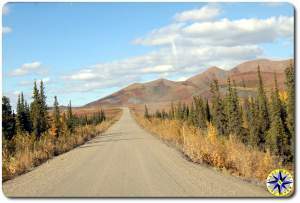 As we moved closer to our adventure’s start date, we expanded the off-asphalt portion to include Inuvik at the top of the Dempster Highway. 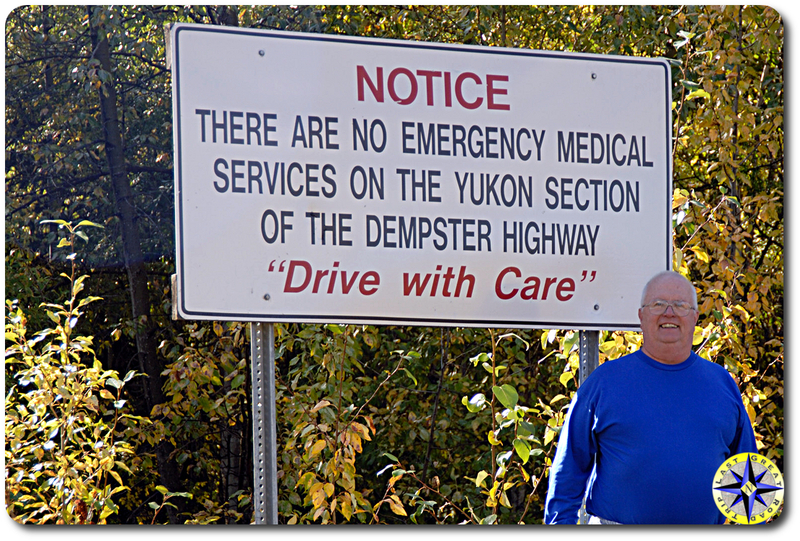 The Dempster Highway is 457 miles from its start out side of Dawson City to its finish in Inuvik. We decided to do this all in one day… Today! We started up the highway around 11:00 a.m. we finished around midnight. And we listened to Jimmy Buffet all the way. The tundra is different here on the Dempster. We are in the hills with the scrubby spruce trees everywhere. 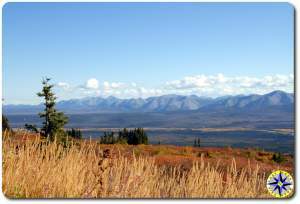 The views are limited when we are on the road but on the hill tops you can see forever. In order for everyone to experience the road, we have a couple of pictures to let you know exactly what Dad and I are experiencing. There is the view we have out the front window. And then there is the view out of the back… we don’t look backwards much… ok any, it’s not like we have traffic following us. And finally there is the view we had on the Dempster as the sun went down. We are finding out that the impulsive portion of our adventure comes with some challenges. 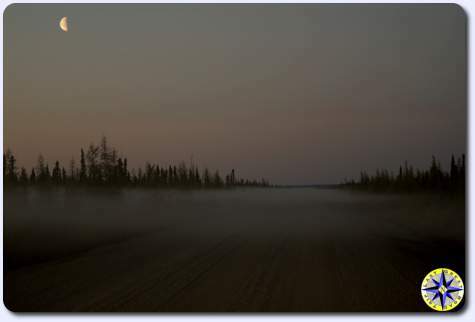 First, we drove into Fort McPherson, about 3/4 up the Dempster planning to fill up the rig. 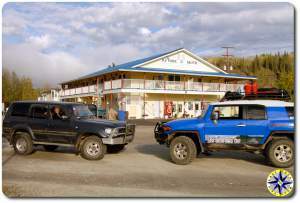 According to the “Mile Post” there are two gas stations to serve travelers. The first one was closed for Labor Day… since when is Labor Day a holiday in Canada? The second was closed just because it was 9:00 p.m. Remember this is a town with less than 1,000 people and very few visitors this or any time of year. 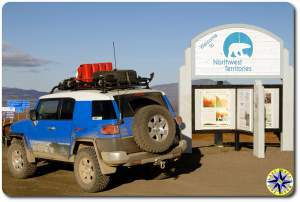 So we left Fort McPherson, with a half a tank of gas, a full set of tunes and a mission from god hoping to make Inuvik, the next fuel stop 186 km north… hoping our km to mpg conversion is correct. Second, we had a ferry to catch… they don’t run around the clock… all we knew was they run about 14 hours a day… but not when they start or when they stop… it was now 9:30 p.m…. drive… DRIVE like HELL and hope it is still running… or… we sleep in the car and catch the first ferry in the morning. The final challenge came when we finally coasted into Inuvik on fumes after catching our ferry (yes we caught the last sailing) and found the hotel we had been referred too. Banging on a locked hotel door should have indicated a problem. When a face finally came to the window, she told us they were closed for the season. For the season??!! This is no way to run a business. Well Dad pulled out the guide books and found the Eskimo Inn. Why the Eskimo Inn… It has the most rooms in town. And we got the last one! Joyce: You were right on the direction… But we turn back north and will be here for another day… than you’re right… it is all south and homeward bound. 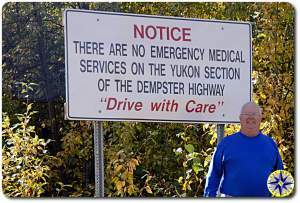 But we plan to have a few more adventures on the way as we connect with the ALCAN. Shelia: Good eyes… but I shaved most of it off this morning… now I’m sporting a goat. That will last until I return home. Your sister hates me with a goat. paul, I hope you got my birthday wishes – 45!! Whooeee. Anyway, I am absolutely loving your descriptions! Say hi to your dad. 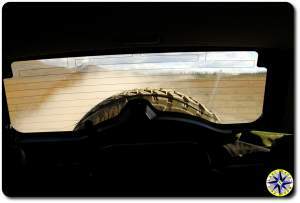 Great picture of looking out the front windshield. Can’t believe you did not get stuck in that mud! I think you said that road was a little 2 mile side adventure you took, correct? Just a note for your future knowledge – Canada does celebrate Labor Day, only they call it Labour Day.